I won’t admit how much of my legal “knowledge” comes from Perry Mason, both the books and the TV show. 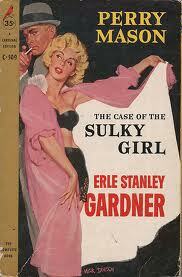 You’ll definitely learn a lot from The Case of the Sulky Girl. Of course, I can’t say how much of what you learn will be accurate! Again, the plot here was strikingly different from that of the TV show, but it was enjoyable. By the way, I’m now accepting gifts of Perry Mason books. Thank you.